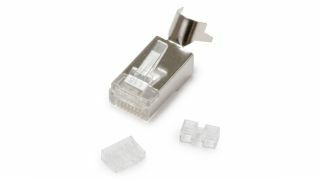 The What: Platinum Tools has launched the new shielded Cat-6A/7 RJ45 (8P8C) modular connector (p/n 106240). The new connector is now available. The What Else: The connector features a cable jacket outer diameter size range of 0.224 to 0.335 inches and an insulation diameter (conductor) size range of 0.037 0.041 inches. It also features three-prong, 50-micron gold plated contacts, three-piece with liner and spacer bar, and is compatible with Platinum Tools Tele-Titan Xg 2.0 Crimp Tool (P/N 12516C). It is UL and RoHS/FCC compliant. The Bottom Line: Designed for both shielded and unshielded cabling, the connector is compatible with Cat-7, Cat-6A, Cat-6E, and Cat-6 cables, and meets ANSI/EIA/TIA/TAA specifications.